IQMTEL offers a unique tool for continuous measurement of the mobile network coverage in different geographical areas. IQMTEL's customers are the most powerful influencers and achievers when it comes to future proofing the connected society; the sub-national levels with true local knowhow! Sub-national levels, such as municipalities, regions, districts etc., have an important role in securing the connected society in their area. They have a helicopter view on all local stakeholders and their interests, and organisational power to take matters forward for improved connectivity - whether it is fixed fibre or mobile network! IQMTEL is a reliable and independent service provider and partner when sub-national levels want to influence others or take own actions. Our customers know why mobile coverage is so important to them. Almost all sub-national levels have functions or development projects that rely on good mobile coverage. There are also national standards for connectivity or mobile coverage. Therefore they have a clear agenda when it comes to developing the connectivity in their local community. IQMTEL's customers use our solution to gain reliable insight about the mobile connectivity in their area. All our customers need a simple, trustworthy and independent overview of the current mobile coverage in order to meet the conditions needed to successfully deliver on other targets for a connected society. With our solution the customer can use ordinary off-the-shelf phones that are configured with IQMTEL's unique application. The application collects signal strength data in the mobile network that is combined with GPS coordinates. We advise our customers to use their own existing resources already moving in the area of interest. It can for example be garbage trucks, postal vehicles, cleaning or other maintenance vehicles, boats, snow vehicles or even pedestrians carrying our special bag. It's as easy as that; plug in a power source, let the existing resource move around normally and the device will measure on its own. As soon as the measurement starts the collected data is automatically and continually sent to our cloud infrastructure where it is stored and processed in short intervals. The result is visually presented in different customizable ways in our cloud-based customer portal. This allows customers to perform their own analysis which can be used as a tool for decision-making. The result can easily be shared with different stakeholders through the customer portal or used in other systems or programs, for example GIS. Our customers can also choose to share the result on their own webpage which can be a very powerful communication tool. Now the real work starts for our customers. It's time to take action based on their gained knowledge and implement it in different ways to meet their connectivity goals. This can mean taking control of the discussion with the mobile network operators to get improvements in coverage, steering implementations in other local development projects or functions, or applying for funding from national or regional funds available for developing connectivity. IQMTEL's customers understand the importance of evaluating implementations and decisions made in earlier work and if they got return on investments. Follow-up measurements, conducted in the same way as before, are usually done once a year. It is easy to compare old and new data to get a clear overview of changes in the mobile coverage. The conditions for a connected society change over time and new challenges and opportunities arise. Our customers work on a long-term basis foreseeing the future for a connected society by updating and setting new goals. New external and internal forces influence how they should act and what is expected from them - new knowledge is again needed! Designed to use and be used by existing resources - innovative and cost efficient! Our solution is developed with sub-national levels in mind and designed to use and be used by our customers’ existing resources, vehicles and people, already moving around in the interesting area – with our solution the customers can be innovative! The solution needs little attention and can therefore be handled by existing staff and vehicles, simultaneously working with other work tasks – with our solution the customers can be cost effective! Our solution is developed to measure the actual signal strength received by the mobile phones from all operators in an fair and equal way where no network speed or other factors influence – with our solution the customers get a true picture of the mobile network! Our solution is developed to be a powerful and transparent tool for communicating insights to important stakeholders; mobile network operators, inhabitants, businesses, politicians, agencies etc. – with our solution the customers can easily present strong and reliable facts and show drive connected to the mobile network agenda! Our solution is developed in a way that allows usage in other programs and systems. Results can easily be imported in external Geographical Information Systems via standard interface or commonly used frameworks – with our solution the customers get to use their own existing tools for analysing the results. Our solution is developed to be user friendly with a visual design allowing customization of the results shown in the customer portal. 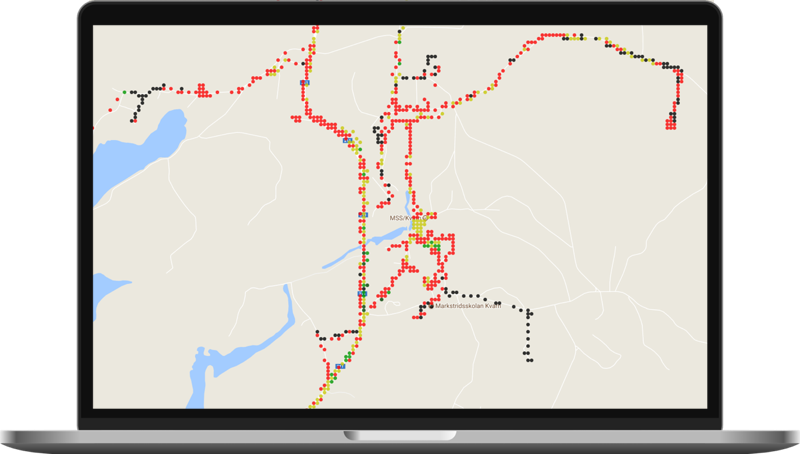 The maps feature simple colour coding and options for different techniques, service providers, general or more detailed information, and different time periods – with our solution the customers can easily find answers to their questions regarding mobile coverage! Our solution is developed in a way that makes it flexible to use whenever measurements are considered to be interesting and necessary. During the agreement period our customers can use our solution as much as they want and conduct important follow up measurements for an evaluation of previous work – with our solution the customers can get information when they need it! "…It is not the new technology that is lagging behind but the old. 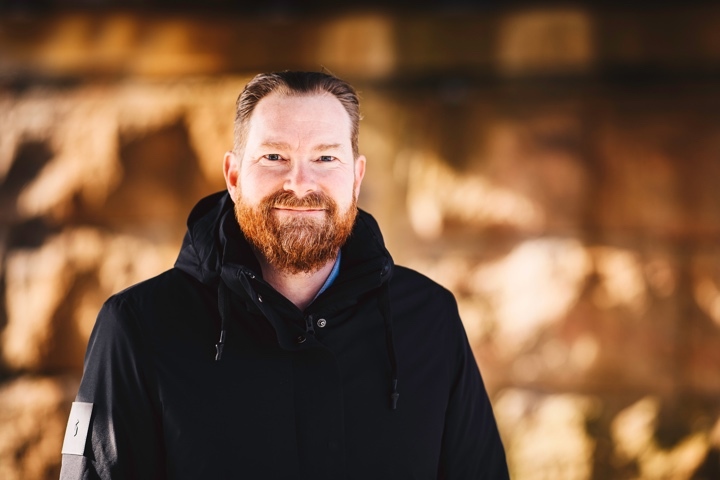 IQMTEL has helped us create the prerequisite for connectivity, which in turn is fundamental for important projects in the future…"
With the help of IQMTEL's smart measuring tools, Region Norrbotten could effectively measure the coverage in its sparsely populated areas. Thanks to local co-operation and effective project management, the collected data will now be used to influence society as a whole. The Swedish Post and Telecom Authority has stipulated national guidelines declaring that all areas, including Norrbotten, should have stable coverage wherever citizens are normally located. Unfortunately, the reality is very different for rural areas where houses and farms are sparsely positioned. - The municipalities in our area have received many complaints from citizens that are experiencing problems with the coverage in different locations. We in the region listened to our citizens and decided to prioritize the issue and try to make a change, says Johanna Lindberg, Regional project manager for the survey in Region Norrbotten. 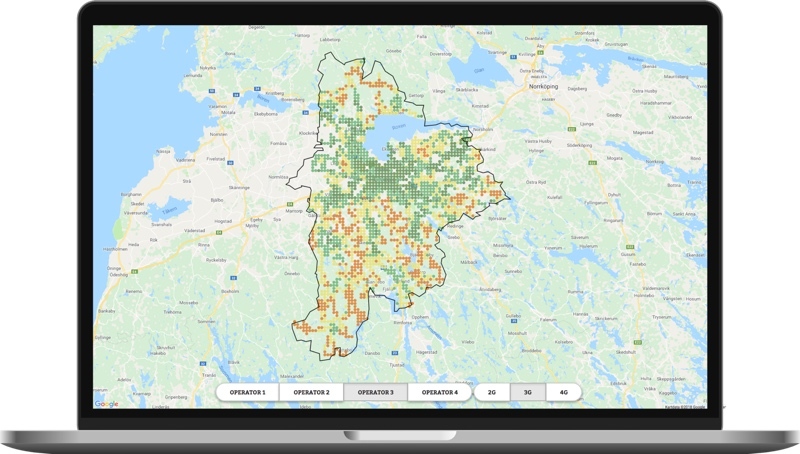 Region Norrbotten came into contact with IQMTEL, that could provide an independent evaluation of the coverage in the region. Thanks to funding from the EU, all the municipalities could participate in the project which began in February 2017. IQMTEL's smart measurement equipment was placed in garbage trucks and the measurement could then be started. - The project has strengthened the bond between our different municipalities and they have learned to co-operate and trust each other. Thanks to the municipalities strong commitment and IQMTEL's smart equipment, the measurement process was smooth and the project was easy to manage, says Johanna. By increasing the citizens availability to connectivity, through both fiber and mobile connection, a solid foundation is created which brings a positive impact to several of the region's other commitments. Today, more and more instances and functions are becoming dependent on connectivity and by securing coverage in all areas, including rural, development can be furthered more rapidly. - It is not the new technology that is lagging behind but the old. If we cannot fully use the technology of today, we lose both time and money. Connectivity is essential for important projects in the future like for example e-health and self-driving cars, says Johanna. IQMTEL's survey has opened doors to many new projects. The region has in conjunction with the measurement also begun working more actively with new digital solutions in healthcare and transport, among others. By using IQMTEL's data in other projects it creates a more cost-effective service. - IQMTEL has surpassed our expectations, they are very flexible which has made it easy bring our own ideas and develop the project ourselves. They have been very supportive through the whole process and we have learned from each other, says Johanna. Thanks to the first survey of the coverage, the region has gained a better understanding of the current situation, and through the next five years the measurements will continue. Soon the gathered data will also be used in negotiations with operators, where the region hopes for many concrete measures. - The survey is a step in the right direction and now the real work starts to influence society at large. We hope that operators will understand the seriousness and work hard to increase coverage, Johanna concludes. IQMTEL - the small company with large ambitions. From the headquarters in Växjö projects are managed in several countries. The business idea is simple yet unique - helping our customers examine mobile coverage. We are passionate about development and, through good customer collaboration, want to improve people's everyday lives through mobile network accessibility. Together with our customers, we want to create long-term prerequisites for all people to partake in the development of modern technology - no matter who they are or where they live. Through continuous development of mobile connectivity, we can create strong communities equipped for the future. IQMTEL is the small team with the broad skills. Our unique tool is used daily to measure mobile coverage in different sub-national levels all over Europe. Our employees have extensive experience in telecommunications, ICT and mobile networks from both state-owned and private companies. After almost ten years in the market, we have accumulated a solid customer base and extensive experience. Our responsiveness to our customers enables us to quickly adapt our offer depending on the situation - a flexibility we are proud of. Even though our customers have high ambitions and expectations on the mobile connectivity, they often lack in-house knowledge about the actual mobile coverage. We at IQMTEL convey a fair and true picture of the coverage and give our customers the prerequisites needed to lead the development forward. Ten years ago, we had an idea to make a real difference and develop the mobile world. Today we have, thanks to our curiosity and forward thinking, helped hundreds of customers. But our journey does not end here. We always strive for progress and hope to measure and map more areas - over the whole world! Competent team with great experience give an effective result. Flexible workflow creates innovative and personal solutions. Comprehensive processes take projects from idea to reality. Mats has extensive and broad experience of ICT. He has previously worked as a technician and consultant in both public and private sector. Mats is fast-paced and is always driven forward by his great curiosity. His knowledge and drive make him a perfect CEO. Staffan is a qualified electrical engineer who has worked with mobile communications for over twenty years. He has previously worked with Radio Planning and Optimisation and as Radio Network Manager. 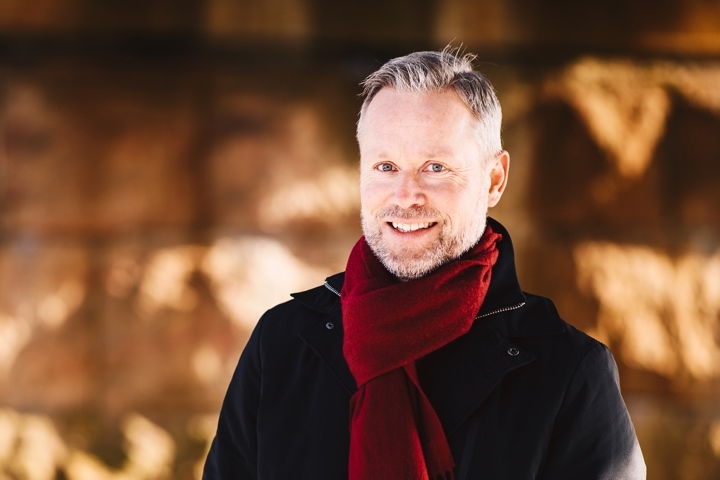 Staffan has wide-ranging experience and is probably one of the most knowledgeable in the industry. Your journey towards future proofing the connected society starts here!